Does your smart phone have a navigator app? Then why do you need to pay so much to have the same thing in your car? Just like phone apps are starting to take over from radio and satellite radio as the preferred way to listen to music (what’s a CD? ), phones with excellent navigation systems seem to make more sense than embedded, expensive brand specific navigation systems in cars. Rather than pick one path, Ford has so many options now available, a buyer can go into a dealership, and if they know how to use their smart phone save thousands of dollars that might have been spent at another brand’s showroom on an unnecessary nav system. Today Ford announced that it will now offer compatibility via its SYNC AppLink system with Scout by Telenav. Scout is a smartphone app that offers a combination of advanced voice activated navigation and points of interest management. For example, Scout can look ahead to the route being travelled, asses traffic situations in real time, and then suggest alternative routes to make the drive as short as practical. It can also locate and direct the user to their favorite chain of coffee shop along the route. Lane assist, traffic camera information, and speed limit alerts are just some of the features it offers. 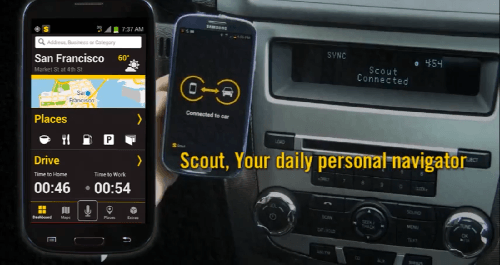 Although users can set the phone next to them in the car and use Scout, Ford also offers integration with the vehicle on some brands. These phones can integrate with the car’s speakers and thereby the music and phone and other applications running in the car will be integrated with Scout. There is a small fee for this, which is paid to Scout by the owner of the phone. There was a time when mobile phones came with a car. People used to call them “car-phones.” That was quickly made ridiculous when people started to have inexpensive phones they took with them everywhere. What Ford has just done is render the dash-integrated, very expensive navigation system obsolete. Many people are starting to think that with MP3 and Bluetooth capability satellite radio may become less attractive. Could we be approaching the tipping point where phones, navigation, and music are no longer supplied with the car, but rather the car has the basic (but high quality) screen, amplifier, and speakers required to convey the content to us? This could save consumers thousands individually, and billions nationally if it takes off. Of course, then the automakers will need to find another profit center to count on. It will also continue the challenge automakers face of differentiating between one another to build brand loyalty. Ford has boldly stepped forward to integrate inexpensive mobile navigation into its vehicles. It will be interesting to see if this goes viral.